I was a teenager facinated by the fact that here was this blurry figure of a man walking on the moon in a space suit built by a company in my own home-town of Dover, Delaware. I watched Neil and Buzz that July evening while visiting my brother in upstate New York where I was on a summer vacation. At that time, I never thought I'd be working at the same company 10 years later. I've been the manager of the Test Lab at ILC for several years now and also act as their company historian. No too many companies even have a historian, but then again, not many companies have such a rich heritage to share. In addition to my job duties that include overseeing and performing all testing on the Space Shuttle suits, I also volunteer my time helping my good friend Amanda Young at the Smithsonian Air & Space Museum. I'm so proud of the efforts she has put into the preservation of the Apollo lunar suits. When I first started helping her on the Saving America's Treasures project several years ago, the suits were not in the best of shape. Since then, she has put all of her blood, sweat and tears into this project and I believe we all owe her a hearty round of thanks for her efforts. I'm happy to say that the suits are now in a condition that should preserve them for decades to come. In some cases, the inner materials may never be saved, but fortunately, the outermost materials and assemblies will look great for decades to come. The Apollo suits were the only items that set foot on the moon (literally) and were returned to Earth. They never sustained a failure that impacted a mission or jeopardized the safety of the astronaut. I feel that it's necessary to provide the details of what made these suits so special. By today's standards they might be considered somewhat crude in respect to the materials used or the mobility they afforded, but when you peel the outside TMG (Thermal-Meteoroid Garment) off, I still marvel at the engineering thought that was put into these masterpieces at a time when no other options were available. 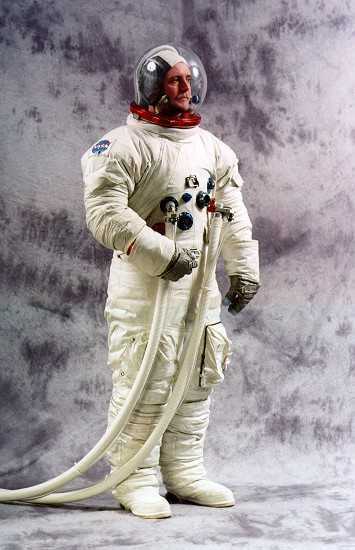 The first image was taken in the summer of 1998 and shows me wearing Gene Cernan's back-up suit (SN 330). NASA sent this suit up to us that summer to evaluate against our - at that time - - advanced I-Suit. I have to say that it's a thrill to get into one of those Apollo suits. I met with Mr. Cernan a year or so after this picture and we had a good discussion about the suits, their mobility, shortcomings, etc. One of the highlights of my career. 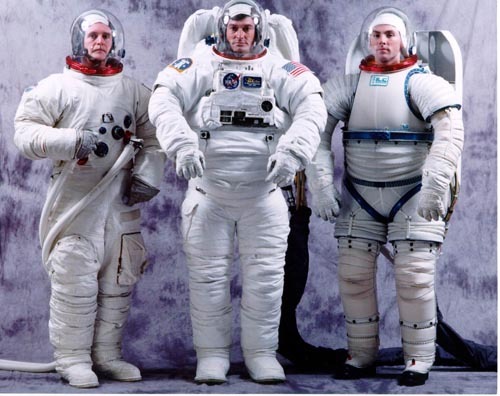 The second image shows me on the left in the Cernan back-up suit; good friend and fellow part-time 'suit subject' Andrew Taylor in the current Shuttle Space Suit Assembly (SSA) in the center; and Lee Lamb in our 1997 I-suit on the right. Back in 1997 when NASA awarded ILC and David Clark advanced suit contracts, our suit was to be called the 'I-suit' for ILC and David Clark was to make a 'D-suit'. As you might know, the Shuttle EMU weighs over 290 lbs in a one-G environment. Not much of a problem in zero-G - other than controlling the mass - but in a 1/6 or 1/3 gravity, weight becomes a big issue. Hence, the need for a lighter suit. In addition, the shuttle suit has no mobility in the lower torso, nor does it need to. However, on the Moon or Mars, a great deal of lower torso mobility is absolutely critical. The I-suit (above) was built around 1997. Since then, we've made at least two new suits that employ some new features such as a better-visability helmet assembly. In addition, we've also recently made a rear-entry, soft upper torso suit per a NASA request. It's also in the process of being evaluated by NASA. The current Shuttle suit has a fiberglass 'hard' upper torso shell. We've been working hard to make this I-suit lighter by using the new fabric upper torso.